We’d love your help. Let us know what’s wrong with this preview of The Tragical Tale of Birdie Bloom by Temre Beltz. Birdie Bloom is a Tragical—an orphan doomed to an unhappy ending. Agnes Prunella Crunch is a witch. The wicked kind. In Wanderly, a meeting between a witch and a Tragical can only end one way: tragically. But lately, Birdie and Agnes have both been searching for something more. And with the help of some mysterious Wi In the fairy-tale kingdom of Wanderly, everyone has a role. To ask other readers questions about The Tragical Tale of Birdie Bloom, please sign up. Whimsical adventure in a land ruled "by the book." If you're an orphan, you'll have a gloomy life and come to a tragical end. If you're a witch? You're definitely wicked. Because that's how things are in books! But what if you . . . don't want to die a tragic orphan? Alone and friendless? What if you're a witch who is tired of doing the same stupid spells over and over? That's where this book comes in. Also, the book within this book. Because orphan Birdie Bloom isn't going to take her Tragical Whimsical adventure in a land ruled "by the book." If you're an orphan, you'll have a gloomy life and come to a tragical end. If you're a witch? You're definitely wicked. Because that's how things are in books! But what if you . . . don't want to die a tragic orphan? Alone and friendless? What if you're a witch who is tired of doing the same stupid spells over and over? That's where this book comes in. Also, the book within this book. Because orphan Birdie Bloom isn't going to take her Tragical ending lying down! Nor is Agnes Prunella Crunch, Wicked Witch! But they're going to need help: help from new friends, from one-eyed cats, gassy blue dragons, blueberry mush, and wayward winds! I can relate to Birdie Bloom. Birdie is an eight year old orphan stuck in this awful house, with awful adults training her for the day she will have to sacrifice her life for a triumphant. That is, until the Winds of Wanderly step in and Foulweather's Home for the Tragical is thrown into utter chaos. I LOVE LOVE LOVE LOVE LOVE this book. What Beltz does well is she really knows how to write an engaging story for young children without using crude and gross language that I see all too often with I can relate to Birdie Bloom. Birdie is an eight year old orphan stuck in this awful house, with awful adults training her for the day she will have to sacrifice her life for a triumphant. That is, until the Winds of Wanderly step in and Foulweather's Home for the Tragical is thrown into utter chaos. Birdie Bloom lives under the iron fist of Mistress Octavia at Foulweather’s Home for the Tragical, where she is constantly reminded that she will meet a horrible and tragical death when she’s finally released from the Home. But, unbeknownst to Mistress Octavia, Birdie has found something very special, and very secret: a book about friendship, that has no ending. Agnes Prunella Crunch is the wickedest of wicked witches. She has spent an entire year combing for the vilest of spells and magic, but Birdie Bloom lives under the iron fist of Mistress Octavia at Foulweather’s Home for the Tragical, where she is constantly reminded that she will meet a horrible and tragical death when she’s finally released from the Home. But, unbeknownst to Mistress Octavia, Birdie has found something very special, and very secret: a book about friendship, that has no ending. Agnes Prunella Crunch is the wickedest of wicked witches. She has spent an entire year combing for the vilest of spells and magic, but soon she realizes that there is no more for her to find. So, she sends letters to her witching comrades, asking them what to do next. But one of her letters is swept up by the mystical Winds of Wanderly, and lands in the possession of Birdie Bloom. I liked how this book was written from two different perspectives, the witch and the Tragical. It gave the story a lot of depth that would’ve been hard to grasp if it had been only one point of view telling the story. Both protagonists have their own subplots but still morphed into one seamless series of events, each affecting the other. Though it was a speed-read for me, I enjoyed it a lot. It was heart-warming and quite interesting, even suspenseful at times. The Tragical Tale of Birdie Bloom by Temre Beltz, 368 pages. Harper Collins, MAY 2019. $17. Birdie Bloom knows her lot in life is to be a tragical figure with a short life, in order to protect the rest of the citizens from bad ends to their tales. Agnes Crunch has been an evil, smelly, warty witch for a very long time, but now she is feeling discontented – bored, you might say. B The Tragical Tale of Birdie Bloom by Temre Beltz, 368 pages. Harper Collins, MAY 2019. $17. Birdie Bloom knows her lot in life is to be a tragical figure with a short life, in order to protect the rest of the citizens from bad ends to their tales. Agnes Crunch has been an evil, smelly, warty witch for a very long time, but now she is feeling discontented – bored, you might say. But witches are solitary creatures; they could never be friends with someone. But the Winds of Waverly have a mind of their own and they have other things in mind for our two characters – something very much outside the pages of the tales the citizens of Waverly have been following all these centuries. An evil witch who maybe isn’t all that evil; a tragic orphan who has room in her heart for enough hope for everyone. The makings of a fantastic tale about exploding through the boundaries others have set for you. This reminded me a bit of Ruth Chew or Glovach's The Little Witch's Black Magic Cookbook in its depiction of witches. (Agnes has a wart on her nose, smelly socks, etc.) Some shades of Lemony Snicket, with Birdie at the orphanage. This had a more elementary tone and set up. My readers want to think of themselves as having magic, so want the witches to read about be powerful or glamorous. Books like Nichols The Apprentice Witch or Little's Bliss are more what I'm looking for, or Delaney's The Last Apprentice for a darker take on witches. 5 stars for THE TRAGICAL TALE OF BIRDIE BLOOM! What a fun and fantastical story Temre Beltz has woven! I love this adorable twist on the traditional fairy tale! The story begins with the "typical" sad orphan/ mean witch, but with delightful footnotes, and many dramatic and hilarious twists and turns, this tale shows how hope, courage, and especially friendship can beat the odds and change one's "fate." Reading this book is truly like watching an artist sketch and then color in a beautiful work o 5 stars for THE TRAGICAL TALE OF BIRDIE BLOOM! What a fun and fantastical story Temre Beltz has woven! I love this adorable twist on the traditional fairy tale! The story begins with the "typical" sad orphan/ mean witch, but with delightful footnotes, and many dramatic and hilarious twists and turns, this tale shows how hope, courage, and especially friendship can beat the odds and change one's "fate." Reading this book is truly like watching an artist sketch and then color in a beautiful work of art. The reader is given more details little by little, filling in the blank spaces and adding more and more color. This is perfect for young readers who can't process all the details at once. There is so much RIGHT with this book - beautiful character development, plot twists, humorous scenes, heartwarming relationships, triumph, tragedy, and at the end, a wish for more of the story to be told! Perhaps the most creative book I have ever read. Incredible vocabulary and use of language. Characters come to life, as we see unlikeliest of friendships develop. Use of footnotes fills this book with creative sidelines. I loved it! an absolutely perfect middle grade. heartfelt, whimsical, and absolutely hilarious. i highly recommend! 4 1/2 stars. A goodreads giveaway. A whimsical, wicked and delightful tale. The best magical fantasy book I’ve read since The School of Good and Evil! A original twist on fairytale worlds and the people who live in them. I loved everything about this book, the footnotes are adorable and useful, the characters were great, the plot is good and it’s an overall cute, adventurous and humorous book! Thank you to the @kidlitexchange network for the advance copy of this novel. All opinions are my own. 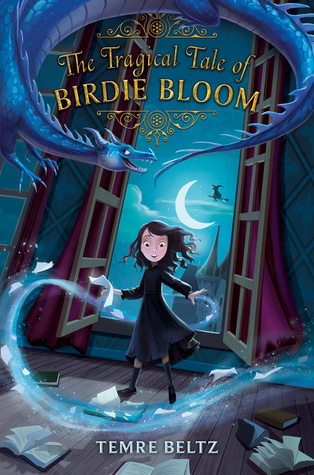 The Tragical Tale of Birdie Bloom is a fun, whimsical, and not so tragical story of magic and friendship. Birdie is a nine-year-old orphan living with seventeen other orphans at Foulweather’s Home for the Tragical in the word of Wanderly. Wanderly is ruled by the “by the book.” This means that your endings are already pre-determined. Tragicals will die horrible deaths, Triumphants will live happily ever after, and wicked witches can only perform curses and dastardly deeds. Books and words have power in Wanderly which is one reason why Tragicals aren’t allowed to have books. Birdie, however, finds a book that teaches her about friendship and leads her to try to create a friendship (actually, Agnes prefers Barely Foul Foe, or BFF) with a wicked witch (that’s Agnes). This attempted friendship causes multiple characters to re-evaluate who they are and what they are possible of. It's perfect: funny, heartfelt, poignant, and smart. I want to time-travel backwards and give this book to my 9-year-old kid self to read because she would have loved it with her whole heart. I guess I'll settle for sharing it with every kid I know now instead.